I was told recently that Durham, North Carolina where I live, ships its yard waste collections to a landfill, but that isn’t true. Nor are they composted. Durham grinds the yard waste and ships it to a Danish biotech company with its North American headquarters in Franklinton, North Carolina near where I commuted by Harley one fall a few years ago to learn to fly an airplane. At Novozymes, Durham’s yard waste (including mine) is recycled into useful enzymes. Solid waste officials in Durham are also working on a pilot program to turn some of the yard waste into compost. North Carolina composts about 7% of its municipal solid waste overall, which is below the 8% average for the South and less than the 10% in the Midwest and 11% along the coastal West. Nationwide, yard trimmings make up 12.9% of municipal waste while residential food scraps another 12.4%. Both exceed the percentage composed of various plastics. Nationwide, the percentage of yard waste that is composted is several times greater than the percentage of food that is composted. At the time I retired from community-destination marketing a few years ago, more than 90 cities and towns in the U.S. were already offering food waste collection and the number continues to rapidly increase. Composting and food waste recycling are commercially viable at a scale well beyond what is being done in backyards because scientists estimate that 40% of the nation’s food supply goes to waste. As individuals, we focus on household waste but the real economies of scale for composting are at the commercial level including restaurants, hotels, schools and grocery stores. Hopefully, when it is launched, Durham’s pilot program, if successful, will move beyond yard waste. 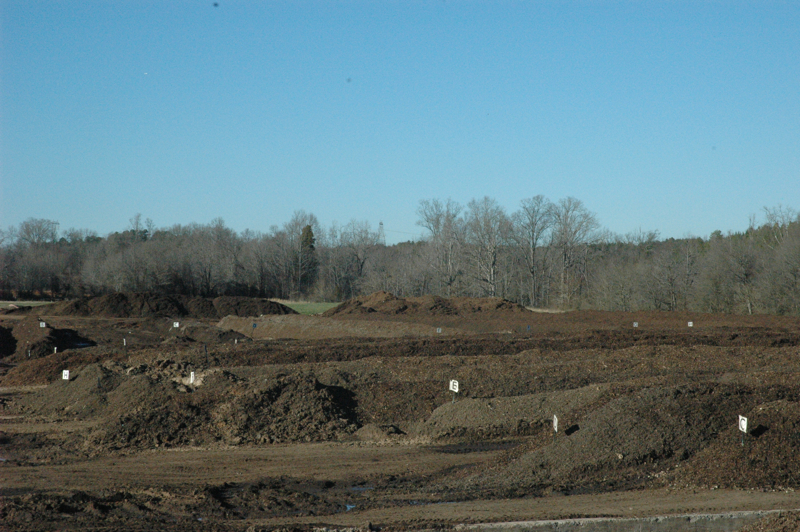 Composting done on a commercial scale began as an alternative way of dealing with waste biosolids. In Durham, those from city facilities will undergo a thoroughly-regulated but not without controversy treatment process in partnership with Synagro, before being utilized by local farms. Biosolids from the county facility go through “in-vessel” composting by companies such as McGill and are made back into branded products used by professional turf managers and landscapers, a process also used on food scraps. Some municipalities such as Goldsboro, NC have built their own “in-vessel” facilities. Another example of a commercial compost approach to waste biosolids and food scraps is Earth Farms Organics based in Dallas, North Carolina, not far from Charlotte, the state’s largest municipality. The company uses windrowing to recycle food waste and biosolids including the use of B2B agreements into 40 tons of commercially viable and branded compost products each year such as top soil. This prevents decomposition into Methane in landfills, a greenhouse gas 21 times more harmful than carbon dioxide and a source of global warming. Left in landfills, food waste is never reused by the environment. Landfills are not composts and there is a very good argument that food waste is a far greater threat to public health than plastics. The promise of bioplastics is not post-consumer, where without expensive upgrades its mixed-use in products such as Coca-Cola’s plant bottles pollutes the recyclable stream, but in commercial and agricultural applications. Backyard composting is useful, but problematic in urban environments where human inconsistency and improper use and neglect can lead to health problems and even lure migratory turkey vultures to lay over. But well-regulated commercial composting with worms or in windrows or in-vessel is a rapidly growing and commercially viable and scalable alternative. The company that processes Durham’s curbside recycling reports that 5% of what it receives is actually trash but it doesn’t complain nor do savvy local officials because it is better to error on the side of recycling than trash. In fact, Durham is very close to a paradigm shift. Instead of posting the growing list of what can be recycled, residents may be better served now by promotion of the shrinking list of things that still must go in the trash cart for pick up. Hopefully, in the near future that list for Durham will no longer include food scraps. I am not a scientist, but I grew up on a ranch homesteaded by my great-grandparents in the shadow of the Tetons. They were not as educated as most members of North Carolina’s legislature are today but they appear a lot smarter. Not content with surrendering tens of thousands of trees along the state’s roadsides to whining out-of-state billboard companies, including vegetation protecting residents from particulates, noise, water pollution and toxic waste the same senate sponsor is now trying to please whining out-of-state trash haulers by undermining North Carolina’s landmark legislation regarding landfills. The proposed changes would reduce or eliminate buffers between landfills and state parks, game lands, national wildlife refuges and wetlands and permit them to be built up higher than North Carolina’s iconic Cape Hatteras lighthouse even though the state has already authorized a 30% increase in overall landfill capacity. I can only assume this extremist arrogance is self-justified in some respect in contrast to eco-Talibans who find fault wherever possible at the other extreme often inhibiting commercial alternatives. It is funny to hear some of my friends argue to exclude use of the word “organic” to a relatively new and very narrow use of that term. My great-grandparents knew better than to lean toward either extreme. My parents and grandparents as I grew up were proud to point out how careful my ancestors were to plant trees along waterways, to create and protect wetlands and meadows, to plant trees to intercept wastewater before septic systems were developed and from the horse barns and corrals. One of my first archeological discoveries were ancestral landfills which had been strategically placed and kept thin enough to regularly turn and aerate and dry. Family artifacts from those explorations are among my most prized possessions today. Among my first chores on the ranch was not only the annual cattle roundup but the much less romantic job of pulling a manure spreader across fields and meadows after the livestock waste had dried in piles, a form of composting. Managing waste is much more complicated in cities, towns and states today than it was on our family ranch in the 1950s. The technologies are improved but the underlying science goes back to my ancestors who different than many lawmakers today understood that it just made good sense.